This past July 27th marked the 59th anniversary of the signing of the armistice that officially put the Korean War on hold. It was a silent holiday that went nearly unnoticed by the world. However, for those soldiers who lived through the Korean War, this was an important day, no matter what side they fought on, and many gathered to remember and to celebrate. SEOUL, June 4 (Yonhap) — North Korea said Monday its military has entered map coordinates of some conservative South Korean media offices as it threatened to strike their headquarters for their alleged insult to North Korea’s new leader Kim Jong-un. The General Staff of the Korean People’s Army said the country’s troops have been targeting the Seoul headquarters of the Chosun Ilbo at coordinates of 37 degrees 56 minutes 83 seconds North latitude and 126 degrees 97 minutes 65 seconds East longitude. It also revealed the coordinates of the JoongAng Ilbo and Dong-a Ilbo newspapers, as well as the KBS, MBC and SBS television stations and CBS radio. It is the first time the North has released coordinates of intended targets in South Korea. “We would like to ask the Lee group if it wants to leave all this to be struck by the (North) or opt for apologizing and putting the situation under control, though belatedly,” the General Staff said in an English-language ultimatum, referring to South Korean President Lee Myung-bak. Seoul, the South Korean capital city of more than 10 million people and home to South Korean media headquarters, is within range of North Korea’s artillery and rockets. “If the Lee group recklessly challenges our army’s eruption of resentment, it will retaliate against it with a merciless sacred war of its own style as it has already declared,” the General Staff said in the ultimatum carried by the North’s official Korean Central News Agency. South Korea defended its media reports on its communist neighbor, saying freedom of the press is a basic right guaranteed in free and democratic countries around the world. The South Korean government said in a statement it “will maintain a posture to immediately cope with any North Korean provocation.” A South Korean military official said no particular movements in the North Korean military have been observed. Also Monday, Unification Ministry spokesman Kim Hyung-suk urged the North to immediately stop threatening the South’s media outlets. He said the North’s threat was a grave “provocation” against South Korea’s free and democratic system. There is no freedom of the press in North Korea where authorities use state media as a propaganda tool to strengthen personality cults of the country’s leaders. The North’s latest threat was in response to some South Korean media reports critical of the North’s celebration of the Korean Children’s Union (KCU) under way in Pyongyang. About 20,000 North Korean children pledged their allegiance to Kim as the North began a six-day festival on Sunday to mark the 66th anniversary of the KCU, according to Pyongyang’s state media. Some South Korean media dismissed the celebration as part of the North’s attempt to win support for Kim, who took over the country following the December death of his father, long-time leader Kim Jong-il. 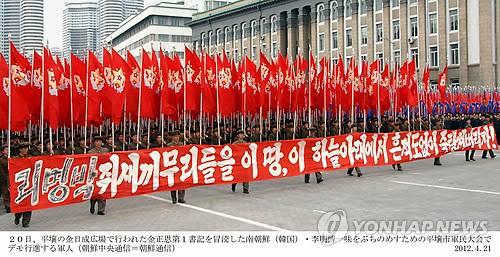 Channel A, a television arm of the Dong-a Ilbo newspaper, likened Kim to the late German dictator Adolf Hitler over the anniversary celebration. The North has long bristled at any outside criticism of its leader and has made similar threats against the South over the past several months, although no actual attack has occurred. South Korea has repeatedly vowed to avenge any North Korean attacks following two attacks by the North in 2010 that killed 50 South Koreans, mostly soldiers. 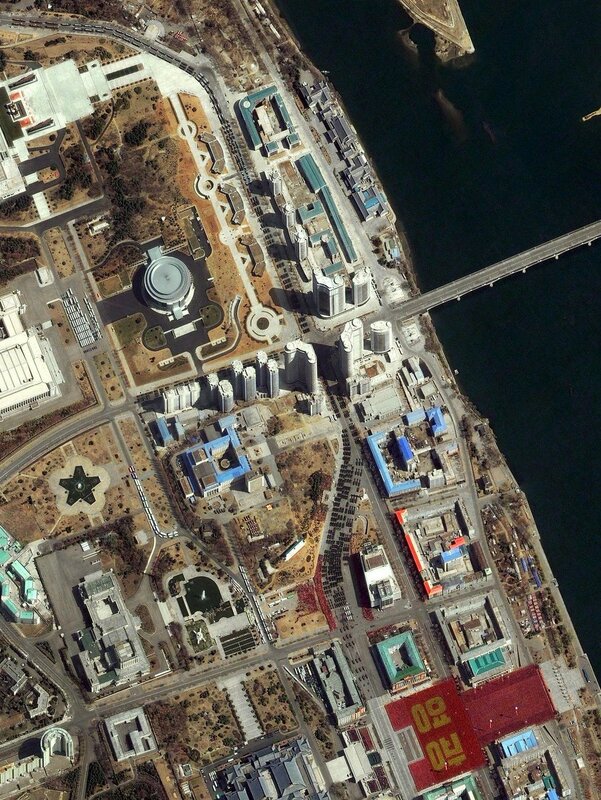 The Korean peninsula is expected to enter a new phase as a result of leadership changes in 2012. South Korea will have a new president by the end of the year, and this is the first fiscal year for Kim Jong-un who assumed the supreme commandership of North Korea after his father’s sudden death in December 2011. In addition, the United States presidential election of 2012 will be held in November. Xi Jinping of China will succeed Hu Jintao as General Secretary and President. As six-party talks play a crucial role in determining the dynamics between South and North Koreas, all of these leadership changes should be taken into account when predicting the future of the peninsula. With the U.S. election being eight months ahead, now is the time to take a look at each candidate’s view on North Korea and how it can affect the South-North relationship in the future. SEOUL, April 23 (Yonhap) — North Korea threatened Monday to launch special military actions to destroy key South Korean targets, further escalating tensions on the Korean peninsula following the North’s botched rocket launch. “The special actions of our revolutionary armed forces will start soon to meet the reckless challenge of the group of traitors,” the North’s military supreme command said in an English-language notice carried by the country’s official Korean Central News Agency. South Korea’s President Lee Myung-bak (L) poses with U.S. President Barack Obama as he arrives for a working dinner at the Nuclear Security Summit at the Convention and Exhibition Center in Seoul, March 26, 2012. U.S. President Barack Obama’s discussions Monday with the leaders of Russia and China appear to have yielded no breakthroughs regarding concerns about North Korea and Iran. The meetings came hours after the president delivered a speech in the South Korean capital calling on the North Koreans to “have the courage to pursue peace” and “take irreversible steps” to meet their international obligations. Nuclear tensions with North Korea and Iran were the focus for Obama and many of the other leaders now in Seoul for the Nuclear Security Summit. (Reuters) – U.S. President Barack Obama urgedChina on Sunday to use its influence to rein in North Korea instead of “turning a blind eye” to its nuclear defiance, and warned of tighter sanctions if the reclusive state goes ahead with a rocket launch next month. “North Korea will achieve nothing by threats or provocations,” a stern-faced Obama said after a tour of the heavily fortified border between the two Koreas resonant with echoes of the Cold War. Such a launch would only lead to further isolation of the impoverished North, which much show its sincerity if on-again-off-again six-party aid-for-disarmament talks are to restart, Obama told a news conference in the South Korean capital.